are curisous to know its new features and the way it works before they go ahead and install it. In this video review we will play with the brand new iOS 7.
iOS had barely changed its face since it first emerged in 2007. 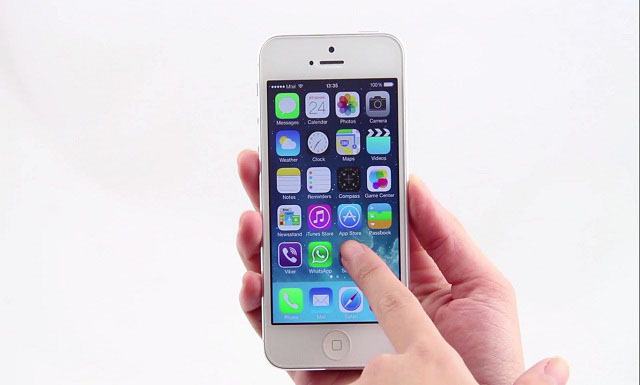 Now, 6 years later Apple chose an entirely different image for their latest iOS 7. It will be available for installing on all iPhone, iPod and iPad devices manufactured after 2010.
iOS new face looks minimalistic. All of the icons, menus, bars and borders have been redesigned to create that airy feel appearance of the interface. Colors have also been pushed to the more pastel hues which are still quite vibrant. The new homescreen looks great and its specialty is the 3-dimensional positioning of the icons on the wallpaper which looks quite distant in the background. It brings a really nice feel of depth. The side menus are now two – both from the top and the bottom of the screen. Since the top one is almost the same let’s take a look at the bottom slide menu. Finally we lived to see Apple make the most basic controls and settings available from any screen. The bottom control center gives you access to tools like Wi-Fi, the Brightness slider, Airplane mode switch and of course the music player controls. Additional tools like the calculator, a flashlight, alarm set-up and a direct camera key also come pretty handy and all of that can be swiped upwards over any screen. The bad thing is that the shortcuts cannot be changed. The top notification center also has been user optimized to be even more flexible and useful. It got a special section which summarizes today’s planned meetings, events or memos so that you have it all scheduled. In fact you can order and customize the content shown on this menu from the settings menu. Besides being entirely different from the previous platforms, the iOS 7 introduces new features like iTunes Radio and the AirDrop sharing platform. The latter is used for sharing contents with nearby devices. To activate it swipe down the control menu and chose the AirDrop icon on the left. It uses Wi-Fi network to transfer any kind of files. Once activated, when you tap for example on a photo it now gives you the option to share it via AirDrop. The new iTunes Radio can generate different music playlists, based on your music preferences. The camera software also gets its own improvements. The shooting controls have also been simplified – a simple swipe to the left and right will switch between photo video and panorama mode. Since Instagram photography have become a separate genre the iOS 7 introduces 9 new interesting filters. You can easily apply them even before you have taken the photo. The iphone’s soul – the voice assistant Siri has also undergone some changes. It is now smarter than ever. Its web searches are now Wikipedia-based. What’s more its researches can now get down to people’s posts from social media websites. Multitasking on the iOS 7 is taken on a whole new level. In my opinion now it’s much more functional than before. Actually it now takes up the whole screen showing you a slider of thumbnails of the open apps. Swiping will browse through the active applications. Actually the Safari browser is changed in the same way. Browsing through the currently open pages is much more intuitive as their thumbnails can be previewed and opened and closed with one swipe.